A car accident is a life-changing event, and there’s nothing to prepare you for it. In the wake of a crash, there may be physical injuries, financial burdens, mounting medical bills, and lost wages. It can be a confusing and difficult time. The claims process and ensuring you receive the compensation you need to make a full recovery shouldn’t further complicate it. The Lansing car accident lawyers at Sinas Dramis Law Firm understand everything you’re dealing with. We remove any extra hassle by successfully navigating your accident’s claims process. Now you can focus on what’s most important – your recovery and healing. We are proud to offer clients a free initial case review. Our Lansing office is conveniently located near the US-127/I-496 interchange at 3380 Pine Tree Rd., Lansing, MI 48911. You can also call to speak with one of our Lansing personal injury attorneys at (517) 394-7500. Our attorneys are recognized as leading authorities on Michigan no-fault law, a complex set of rules that apply to nearly all accidents involving motor vehicles. The no-fault system basically guarantees the payment of certain insurance benefits to car crash victims – allowable expenses, work loss benefits, and replacement services. However, oftentimes, two types of claims arise from an auto accident – 1.) no-fault claim and 2.) liability claim if you were not at fault for causing the accident. Through a claim against the at-fault driver, you may obtain compensation for pain and suffering as well as excess economic loss damages, which is considered any income loss above and beyond the three years and $5,700 per 30-day period maximum. This is payable through your no-fault benefits. Understanding the ins and outs of both claims can be confusing and not all attorneys understand this unique complexity. As Michigan car accident attorneys, we have educated ourselves thoroughly in order to confidently handle all aspects of your claims. We look forward to advocating for your rights to obtain the best results you’re entitled to. Car accidents happen everywhere, but Lansing has some of the most dangerous roads and intersections in the state for crashes. 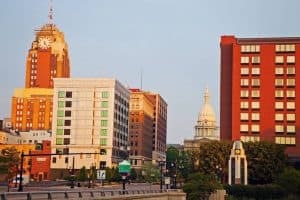 Lansing car accident lawyer, Steve Sinas, reports on these areas, including some of the worst offenders along the I-496 and US-127 corridor in Lansing. Our firm also regularly offers driving tips to motorists who frequently travel this area, in a campaign called Drive Safe Michigan. Check out more information about some of Michigan’s most dangerous roads. Over the years, Sinas Dramis has helped thousands of Michigan auto accident survivors and their families. We help our clients get the insurance benefits and compensation they deserve. We’ve successfully settled complicated wrongful death claims, obtained fair compensation for victims of semi-truck collisions, and helped motorcyclists involved in car accidents. We are committed to achieving the best results for our clients given the nature of injuries, case specifics, and available insurance coverages. We’ll discuss all of these specifics with you in an initial case evaluation. The following are just a few of the car accident verdicts or settlements our attorneys have obtained for victims and their families. $3 million for a female high school athlete injured while a passenger in a vehicle. $2.15 million settlement for the wrongful death of a young college student after her vehicle collided with a commercial vehicle. $2.75 million for a no-fault claim involving unpaid attendant care benefits. $980,000 Car versus semi-truck accident in Eaton County resulting in the wrongful death of a 54-year-old-man. $859,000 settlement regarding a Clinton County car crash on behalf of a man who struck after the oncoming vehicle crossed the center line. $750,000 auto negligence verdict on behalf of a man t-boned by a taxi cab in Clinton County. $600,000 for a college student seriously injured in an auto accident. $585,000 for a college-aged female injured in a Lansing car crash. $470,000 for a 58-year-old man injured in a Lansing auto accident. $360,000 recovery of first-party no-fault benefits for traumatically brain injured Lansing man involved in a motor vehicle accident. $200,000 settlement for Lansing woman who sustained serious injuries as a passenger in a motor vehicle accident. $135,000 compensation for elderly Lansing woman with a head injury and accelerated dementia following a car crash. Sinas Dramis Law Firm first opened its doors in 1951 in Lansing. With a longstanding history in the community, we are proud of our reputation of success. In particular, we passionately advocate for the rights of the injured in Lansing and throughout the state of Michigan. We don’t settle for anything less than our clients deserve. We also dedicate many of our efforts to helping people better understand the law, especially Michigan’s complex no-fault system. Our personal injury attorneys regularly appear on Fox 47’s Morning Blend to share particular laws that most affect the lives of everyday citizens. If you have been injured in a motor vehicle collision, contact our Lansing car accident lawyers today for a free consultation.